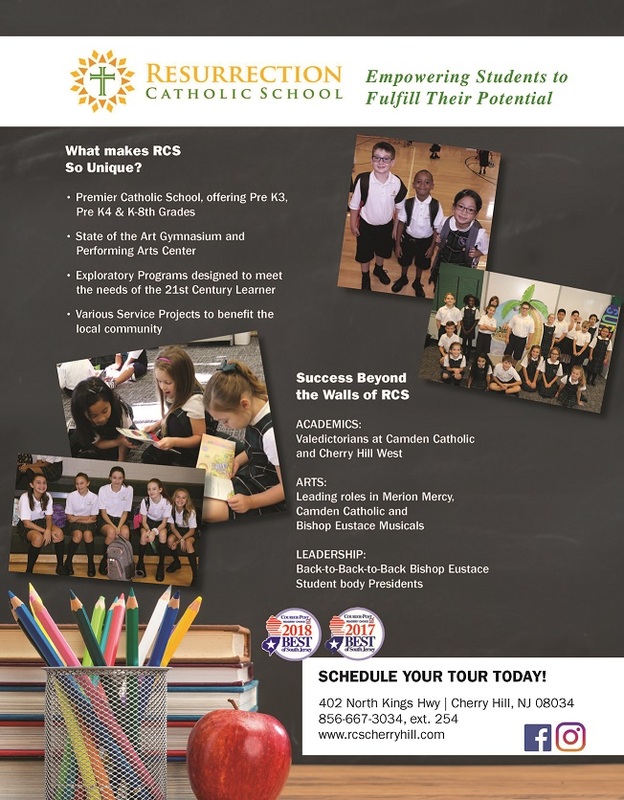 Resurrection Catholic School is the premier Catholic elementary school in South Jersey. We primarily serve students from Pennsauken, Haddonfield, Maple Shade, Moorestown, Mt. Laurel, and Cherry Hill. We are committed to educating the whole child. With regards to this commitment, we focus on developing a strong sense of self and a high regard for others by staying firmly rooted in Jesus call to love and welcome all people. We offer a rigorous and challenging curriculum that engages all students. At RCS, we provide a wide-range of classes, such as, Accelerated Math/Language Arts, Resource Room, and General Education classes. To meet the needs of working families, we offer various pre-school programs, Full-Day Kindergarten - 8th grade. We have a strong enrollment and offer students the opportunity to participate in various activities outside the typical school day. 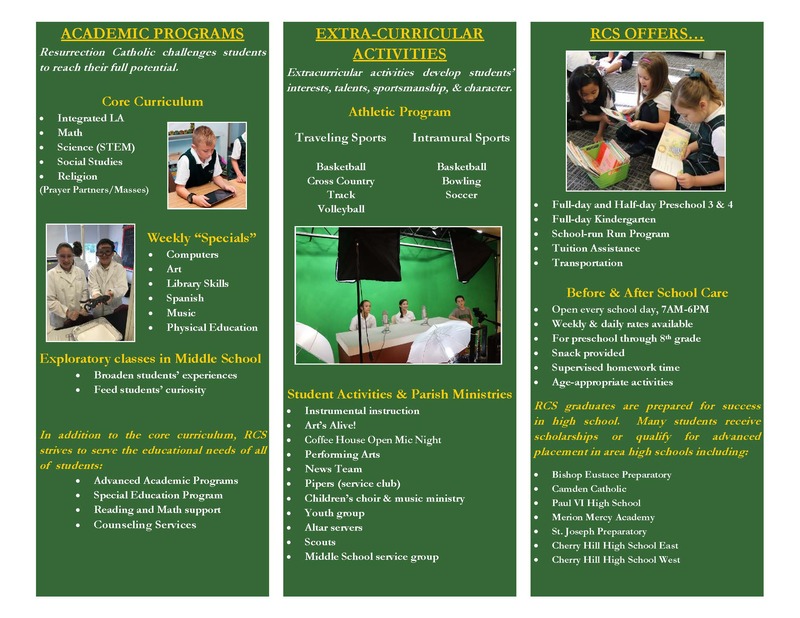 Our Performing Arts, Athletics, and Community Service Programs, along with the outstanding academics, help shape our students to go on to be mindful leaders in both Catholic and public high schools. 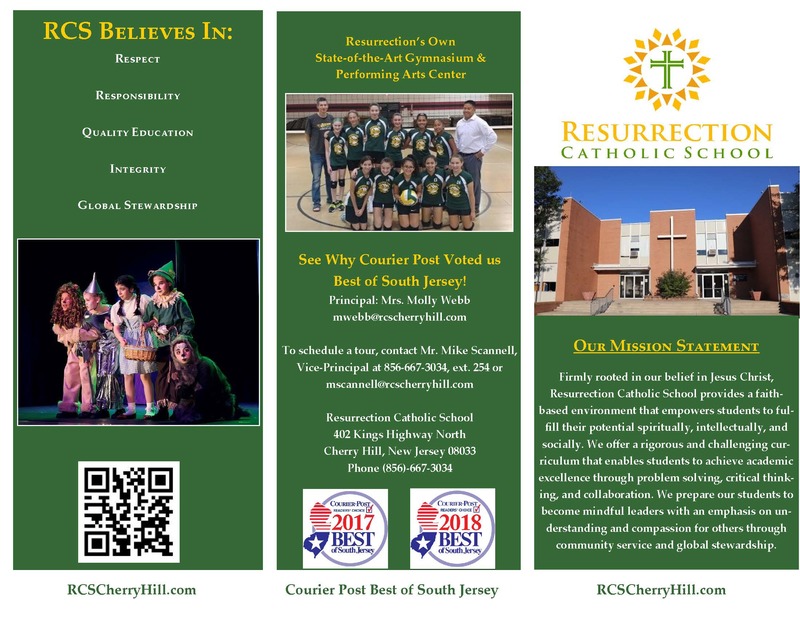 In 2015-2016, two alumni of RCS had the honor of being selected the High School Validictorian at Camden Catholic and Cherry Hill West, respectively. Come catch the RCS spirit by taking a tour, or arranging for your child to shadow. Contact Mr. Michael Scannell at 667-3034, ext. 254 for additional information.